I thought I would open with a picture of this algae as it’s the easiest way to identify it. Better known as Rhizoclonium, if you have this algae I can guarantee that you have low nutrients and poor water circulation. 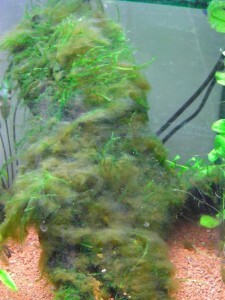 It’s about the only time you will see this algae and as a result it’s very easy to get rid of. Occasionally you will see it in a CO2 infused tank but it’s not so common in tanks such as that. Sometimes simply by improving your water distribution by using a Hydor Koralia Pump this algae will disappear because the nutrients that are in your tank and being moved around better than before. If that fails just add a bit more fertiliser such as Neutro T and don’t forget to add it on a daily basis.